Set in an average altitude of 3500m, the 429km stage4 was a tough challenge for the first day of the Marathon stage. All of the early Special stages, except for the Prologue, had been cancelled or shortened in this year’s Dakar due to the weather, making this long and demanding stage4 the first to be carried out as planned. The fact that stage4 and 5 are Marathon stages, meaning the riders will not be able to receive any support by the mechanics at the bivouac, not only speed but a combination of skills are needed to complete the stages safely, giving the Dakar an adventurous taste. In the demanding route with altitudes reaching 4000m at times, both TEAM HRC and Honda South America Rally Teams were bursting with performance. Clocking 3 hours 49 minutes 29 seconds, Paulo Goncalves won the stage with local Kevin Benavides following in second place at 3 hours 54 minutes 15 seconds. Also in fourth came Joan Barreda at 3 hours 55 minutes 03 seconds. According to the information from the Way-Points (*GPS controlled points set on the course), Barreda was the rider with the speed today, totally blowing away his rivals at an amazing 3 hours 50 minutes 03 seconds. However he had yet again been caught over-speeding, resulting in a 5minute penalty putting him back in fourth position. All other TEAM HRC riders, Michael Metge, Ricky Brabec and Paolo Ceci made it safely back to bivouac where only the riders can enter. 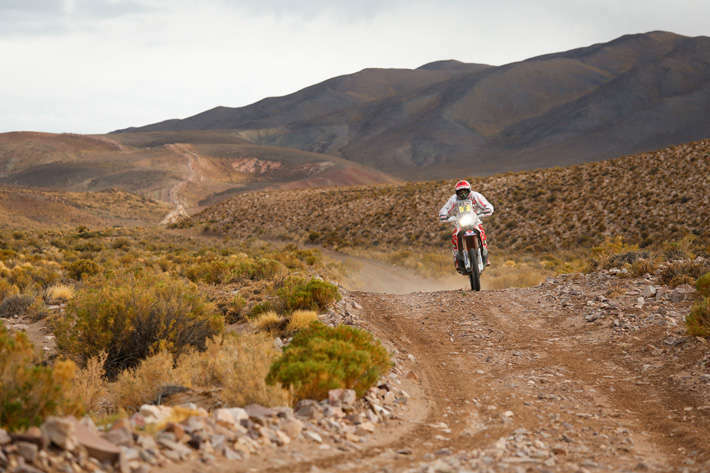 Also riders from the Honda South America Rally Team, Javier Pizzolito, Adrien Metge and Jean De Azevedo all completed the stage within 35th position, putting them further up in the overall ranking. Now getting familiar with the race, all nine CRF450RALLYs and their riders will tackle the second day of the Marathon stage, the highlight of the first half of 2016 Dakar. Supporting crew of each team headed to Bolivia ahead of the riders to welcome them at Uyuni the next day. On the roads to Tarija, where the bivouac is set, the locals were overflowing to welcome the Dakar as it was so last year. Gentle winds and thicker air awaits the tired riders at this town at an altitude of 1880m.